Soft tissue sarcoma (STS) diagnosis is challenging because of a multitude of histopathological subtypes, different genetic characteristics, and frequent intratumoral pleomorphism. One-third of STS metastasize and current risk-stratification is suboptimal, therefore, novel diagnostic and prognostic markers would be clinically valuable. We assessed the diagnostic and prognostic value of array-based gene expression profiles using 27 k cDNA microarrays in 177, mainly high-grade, STS of 13 histopathological subtypes. Unsupervised analysis resulted in two major clusters – one mainly containing STS characterized by type-specific genetic alterations and the other with a predominance of genetically complex and pleomorphic STS. Synovial sarcomas, myxoid/round-cell liposarcomas, and gastrointestinal stromal tumors clustered tightly within the former cluster and discriminatory signatures for these were characterized by developmental genes from the EGFR, FGFR, Wnt, Notch, Hedgehog, RAR and KIT signaling pathways. The more pleomorphic STS subtypes, e.g. leiomyosarcoma, malignant fibrous histiocytoma/undifferentiated pleomorphic sarcoma and dedifferentiated/pleomorphic liposarcoma, were part of the latter cluster and were characterized by relatively heterogeneous profiles, although subclusters herein were identified. A prognostic signature partly characterized by hypoxia-related genes was identified among 89 genetically complex pleomorphic primary STS and could, in a multivariate analysis including established prognostic markers, independently predict the risk of metastasis with a hazard ratio of 2.2 (P = 0.04). 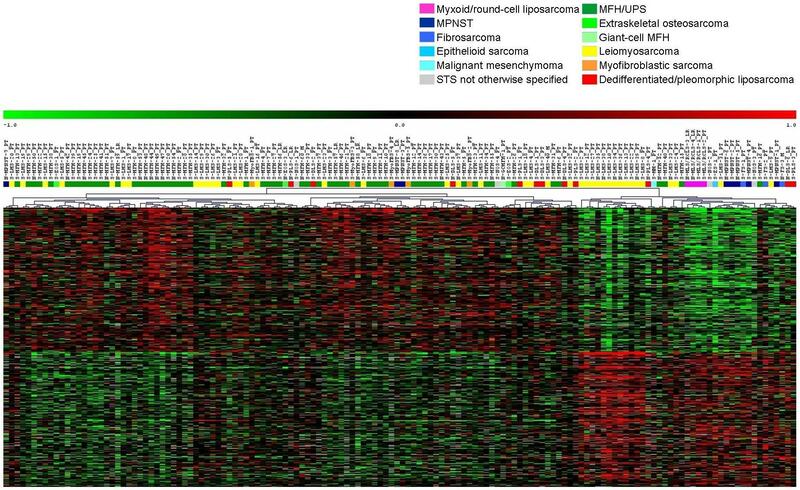 Diagnostic gene expression profiles linking signaling pathways to the different STS subtypes were demonstrated and a hypoxia-induced metastatic profile was identified in the pleomorphic, high-grade STS. These findings verify diagnostic utility and application of expression data for improved selection of high-risk STS patients. Soft tissue sarcomas (STS) account for ~1% of all malignancies and represent a heterogeneous group of mesenchymal tumors, the clinical management of which is challenging and requires multidisciplinary efforts that take the combined information from clinical investigations, imaging, histopathology, and cytogenetic and molecular genetic analyses into account. STS comprise more than 30 histological subtypes, although malignant fibrous histiocytoma (MFH)/undifferentiated pleomorphic sarcoma (UPS), liposarcoma, leiomyosarcoma, synovial sarcoma (SS), and malignant peripheral nerve sheath tumor (MPNST) account for three-fourth of the tumors . Some STS subtypes are characterized by specific chromosomal translocations causing novel gene fusions e.g. SS18-SSX in SS and TLS-CHOP in myxoid/round-cell liposarcoma. However, a large group of STS, e.g. MFH/UPS, leiomyosarcoma, and dedifferentiated/pleomorphic liposarcoma, lack known specific recurrent alterations and are characterized by a multitude of rearrangements, amplifications, deletions, and somatic alterations, including mutations in TP53, deletions of RB1 and CDKN2A, and amplifications of MDM2 and CDK4 [2, 3]. Gene expression studies have revealed diagnostic profiles and upregulation of specific pathways in sarcomas with type-specific genetic defects, e.g. SS, dermatofibrosarcoma protuberans, clear-cell sarcoma, Ewing sarcoma, rhabdomyosarcoma and gastrointestinal stromal tumors (GIST) [4–14] and have provided potential targets for novel therapies [15–18]. From a diagnostic point of view, the above mentioned tumor types can be identified from their underlying gene fusions, but the expression data reveal novel genes and pathways including multiple downstream targets of the resultant chimeric transcription factors, which provide a basis for the understanding of key biological changes in STS development. In contrast, molecular classification of the predominant, genetically complex STS subgroups, e.g. MFH/UPS, leiomyosarcoma, and dedifferentiated/pleomorphic liposarcoma, has been difficult with extensive pleomorphism that has precluded identification of recurrent profiles [9, 10, 12, 14, 19, 20]. STS are highly malignant and metastases develop unpredictably in one-third of the cases, therefore, new prognostic markers would be of great clinical value. However, there have been only two reports of expression profiles associated with poor outcome in STS, both in leiomyosarcomas [21, 22]. With the aim to establish diagnostic expression profiles for STS and to assess whether gene expression profiling can provide prognostic information, we used 27 k cDNA microarrays to characterize the expression patterns in a mixed series of 177 STS, with particular focus on high-grade pleomorphic tumors. When the 177 STS were subjected to unsupervised cluster analysis, based on the 6140 spots that passed the filter criteria, the dendrogram split into two major branches (Figure 1). One branch (referred to as S for simple/specific) consisted mainly of STS with simple, type-specific genetic defects and contained 31/32 SS, all 4 myxoid/round-cell liposarcomas, all 3 GIST and all 3 fibrosarcomas, in addition to 5/8 MPNST, 3/40 leiomyosarcomas, 5/60 MFH/UPS, 2/4 STS not otherwise specified (NOS) and the single epithelioid sarcoma. Herein, SS, GIST, myxoid/round-cell liposarcomas, and MPNST formed tight subclusters. The other branch (referred to as C for complex) consisted mainly of genetically complex, often pleomorphic STS subtypes and contained 55/60 MFH/UPS, 37/40 leiomyosarcomas, all dedifferentiated/pleomorphic liposarcomas, myofibroblastic sarcomas, and extraskeletal osteosarcomas along with the remaining 3 MPNST, 2 STS NOS, 1 SS and the single giant-cell MFH and malignant mesenchymoma. A subset of 11 leiomyosarcomas formed a distinct tight subcluster within C. When the 17 xenograft samples were included, a similar pattern of unsupervised clustering was observed and all 3 xenografts derived from tumors included in the study clustered next to their respective patient samples [see Additional file 1] suggesting that expression patterns of xenografts well reflect those of patient tumor material. A separate unsupervised cluster analysis of the 19 liposarcomas (16 tumors and 3 xenografts) separated the 5 myxoid/round-cell liposarcomas (characterized by the TLS-CHOP fusion) from the 14 dedifferentiated/pleomorphic liposarcomas (with complex genetic alterations) [see Additional file 2]. Unsupervised cluster analysis of the 177 STS samples resulted in two major subclusters: C dominated by pleomorphic STS subtypes with complex genetic alterations and S mainly containing STS of distinct histopathological subtypes with specific fusion genes or mutations. Discriminatory gene lists were generated by ranking genes based on their Golub-scores and performing 1000 random permutations to establish false-discovery rates (FDR) [see Additional files 3 and 4]. As expected, the strongest expression signals (with gene lists containing between 900 and 4000 genes with FDR of 11%) characterized STS subtypes with specific genetic defects, e.g. SS, GIST and myxoid/round-cell liposarcoma. The MFH/UPS, leiomyosarcoma, and MPNST were characterized by discriminatory gene expression signals containing 90 – 300 genes with FDR of 11%. Weak signals with high FDR characterized the fibrosarcoma (50% FDR for top 200) and dedifferentiated/pleomorphic liposarcoma (66% FDR for top 150), whereas myofibroblastic sarcoma and extraskeletal osteosarcoma were small heterogeneous groups without discriminatory profiles. The SS were characterized by the strongest expression signature containing 4000 differentially expressed genes with a FDR of only 11%. Multiple developmental pathways that interact to regulate embryonic development and organogenesis were upregulated in SS. These genes included ERBB2, FGFR1, FGFR3, FGF18, and FRAG1 from the EGF and FGF receptor signaling pathways, members of the Hedgehog (Hh) signaling pathway like PTCH, SMO, BMP7, FOXM1 and CSNK1E, retinoic acid receptor (RAR) pathway genes like RARA, RARG, MDK, MEIS1 and PRAME, and genes involved in Notch receptor signaling like NOTCH1, JAG1 and the transducin-like enhancer of split genes. EASE (Expression Analysis Systematic Explorer) identified overexpression of the Wnt receptor signaling pathway including AXIN2, LEF1, TCF7, WISP2 and the frizzled homologs, and the TGF-β signaling pathway including RUNX3, SMAD6, TGFB1, TGFB2 and the bone morphogenetic proteins. One of the largest functional groups of upregulated genes was that involved in chromatin remodeling including several histones and SWI/SNF related matrix associated actin dependent regulator of chromatin (SMARC) genes. A large number of neural differentiation genes like EFNA1, NCAM1, NEDD5, NPDC1 and OLFM1, ribosomal protein genes, many forkhead box transcription factors and the SS chromosome X breakpoint genes SSX1 and SSX3 were also highly expressed [see Additional files 5 and 6]. The GIST, with activating mutations in the KIT gene were characterized by a distinct expression profile of 900 genes (11% FDR), including top overexpressed genes involved in the KIT receptor signaling pathway, e.g. KIT, and PRKCQ (SCF, PIK3CB and PIK3R1 were also overexpressed but a bit further down the list beyond the 11% FDR cut-off), and other developmental pathways, e.g. BMP4, FGF2, IGF2, SFRP1 and TLE4, as well as neurogenesis and neural differentiation genes like SMPD1, HOXA4, CIT, HOXA9, SIM2, NPTX1, NEDD5 and DCTN1. Other groups of highly expressed genes identified in the EASE analysis were those involved in protein transport, lipid metabolism and kinase activity [see Additional files 7 and 8]. A distinct expression signature of about 1000 differentially expressed genes (11% FDR) characterized the myxoid/round-cell liposarcomas. Herein, several lipid metabolism genes, including DGKD, EBPL, FABP5, LPL, MGLL and PPARG were upregulated, as were many developmental genes, ribosomal subunit genes and genes involved in amino acid and carboxylic acid metabolism [see Additional files 9 and 10]. Golub-score analysis identified a 100-gene signature (11% FDR) characterized by overexpression of developmental pathway genes like FRAG1, WISP2, RARRES3, SPRY1 and SMO from, e.g. the Wnt, RAR and Hh signaling pathways. Moreover, genes related to neural development such as NEDD4, NPDC1, GSTP1, and DSCR1, and several ribosomal protein genes were also highly expressed [see Additional files 11 and 12]. A 200-gene signature (11% FDR) characterized by overexpression of muscle-specific genes like ACTN3, CALD1, MBNL1, MLC1, MYH11, MYL4, SLMAP, TPM2 and TAGLN3 was identified in the leiomyosarcomas. EASE analysis also identified upregulation of carbohydrate metabolism and energy pathway genes [see Additional files 13 and 14]. A 300-gene signature (11% FDR) was identified for the MFH/UPS samples and the top upregulated functional groups included cathepsins and genes related to protein degradation, inflammatory response, cell motility, proliferation, cell-cycle control, and intracellular signaling [see Additional files 15 and 16]. The gene lists for dedifferentiated/pleomorphic liposarcoma and fibrosarcoma had large numbers of false positives among the ranked genes. However, the dedifferentiated/pleomorphic liposarcomas were characterized by a weak discriminatory 150-gene signature, which when used in a supervised cluster analysis grouped 5/12 dedifferentiated/pleomorphic liposarcomas tightly with 2 MFH/UPS, 2 leiomyosarcomas and 1 fibrosarcoma. Despite the high FDR, CDK4, MDM1, MDM2, OS4 and SAS, were among the top overexpressed and are along with several other highly expressed genes, e.g. NUP107, SLC26A10, SLC35E3, TMBIM4, TSFM and YEATS4, located in the 12q14 and 12q15 amplicons. EASE analysis also identified the above-mentioned gene group on chromosome 12q14-q15. Interestingly, also the MFH/UPS, the leiomyosarcomas and the fibrosarcoma that clustered tightly with the dedifferentiated/pleomorphic liposarcomas showed amplification of CDK4 and MDM2 when analyzed by array comparative genomic hybridization (data not shown) or Southern blot analysis . In addition, genes involved in receptor activity, signaling and lipid metabolism (some of which have previously been reported in liposarcoma) such as ACAA2, ARSA, DHRS3, PDE3A, and PPARA, were upregulated [see Additional files 17 and 18]. 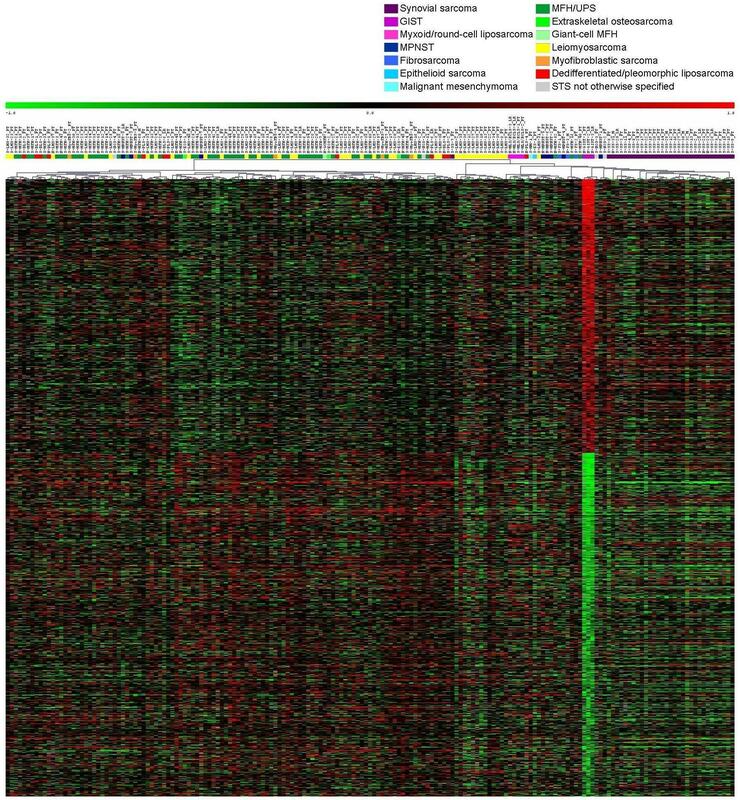 Golub-score analysis identified a relatively poor discriminatory signal of 200 genes for the fibrosarcomas, which regardless of high FDR contained several of the upregulated genes previously associated with fibrosarcoma, e.g. BMI1, H1F0, LEF1, RBM4, ITM2A, IGFBP2 and PTGS2 . Upregulation of developmental genes like BMP7, SMO, VANGL2, SFRP1, PRRX1, MDK, OLFM, IGFBP3, IGFBP5 and TGFBR3 in the fibrosarcoma samples suggests similarity to SS, GIST, myxoid/round-cell liposarcoma and MPNST explaining its classification within subcluster S in Figure 1 [see Additional files 19 and 20]. This shows that FDR, though important, cannot be taken at face value without the risk of losing biologically relevant information, especially in the case of STS where high FDR may result not only from heterogeneity and errors in diagnosis but also due to common pathogenic pathways resulting in similarities or overlap of expression profiles between different STS subtypes. In an independent analysis (including 16 tumor and 3 xenograft samples), the 5 myxoid/round-cell liposarcomas were compared to the 14 dedifferentiated/pleomorphic liposarcomas. A 800-gene signature (11% FDR) distinguished the two groups [see Additional file 2]. Developmental genes including members of the Wnt receptor signaling pathway, e.g. DAAM1, FZD8, MYC, PRICKLE1, SFRP1 and WISP2, and neurogenesis genes, e.g. CPNE6, EFNA5, FEZ2, LHX2, MDK and NTNG1 were upregulated in the myxoid/round-cell liposarcomas as compared to the dedifferentiated/pleomorphic liposarcomas, as were several ribosomal protein genes and genes involved in adhesion and amino acid metabolism. Genes highly expressed in the dedifferentiated/pleomorphic liposarcomas included cell-cycle genes like CCNA2, CCNB2, CDC2, KIFC1, KIF23 and PTTG1, motility genes like AMFR, ANXA1, CKB, CNN2 and FN1 and homeostasis-related genes. A smaller number of lipid metabolism genes were overexpressed in the myxoid/round-cell liposarcomas compared to the dedifferentiated/pleomorphic liposarcomas with genes such as DGKD, EBPL, FABP5, FDFT1, LPL and PPARG upregulated in the former group, while ADM, ANXA1, ANXA4, CRYL1, GRN, PLA2G4A, PLA2G12A, PLD1 and PLTP were overexpressed in the latter [see Additional files 2 and 21]. Similar results were obtained even with the exclusion of the 3 xenograft samples further supporting the notion that xenografts reflect gene expression patterns of patient tumor material and can with some caution be included in gene expression studies of STS to increase sample size for rare tumor types. About 50% of the patients diagnosed with STS succumb to their disease owing partly to the high metastatic potential of these tumors but risk-assessment is rather difficult with very few reliable prognostic factors . 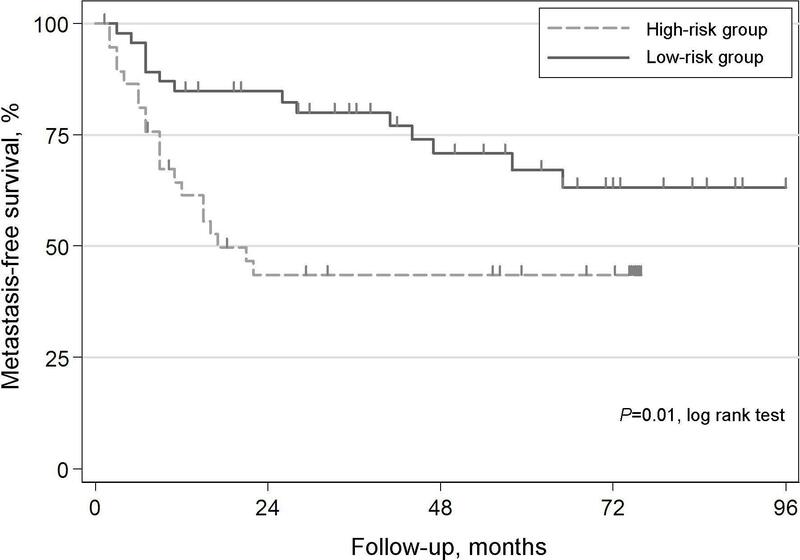 The different STS subtypes are associated with variable outcome with a favorable prognosis for patients with myxoid liposarcomas and a high risk of metastases for patients with MFH/UPS and SS . Since the majority (76%) of the tumors in our series were high-grade, pleomorphic STS, we chose to evaluate the presence of a prognostic signature within subcluster C among the most heterogeneous samples. After excluding local recurrences, metastases, samples treated with preoperative chemotherapy, the single SS and 3 MPNST (that were outliers from cluster S), the 11 leiomyosarcomas with a distinct profile, and the dedifferentiated/pleomorphic liposarcomas with the MDM2-CDK4 double amplification, 89 primary STS remained for the analysis. Exclusion of the leiomyosarcomas and liposarcomas that formed subclusters within C was done in order to detect the more subtle prognostic signal among the most pleomorphic samples (Table 1). Golub-score analysis with 1000 random permutations identified a 200-gene prognostic signature (35% FDR) distinguishing tumors that metastasized (n = 39) from those that remained metastasis-free (n = 50) (Figure 2). In order to obtain a more robust list of discriminators, a consensus gene list of 244 genes with median rank less than 700 was generated, as described in the methods section, with the majority of the genes from the Golub-score ranked list being present in the consensus list. 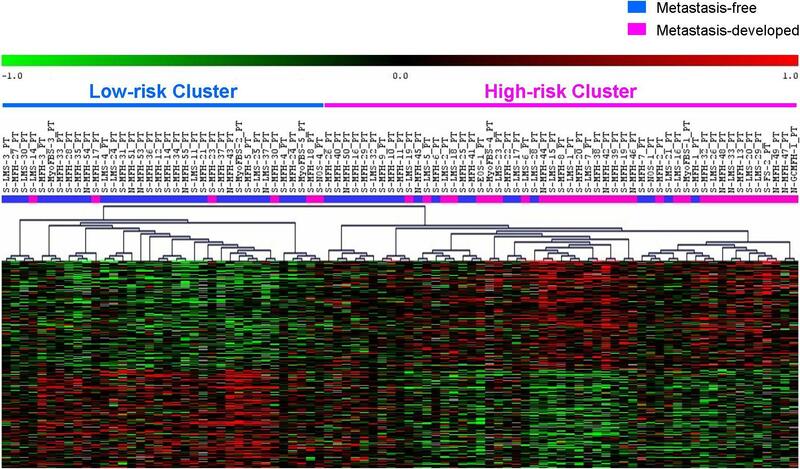 Hierarchical clustering based on the consensus list split the 89 samples into two clusters with metastases developing in 6/36 (16%) in the low-risk cluster compared to 33/53 (62%) in the high-risk cluster (Figure 3). The genes overexpressed in the metastasizing tumors included HYOU1, HIF1A, HIG2, DDIT4, TFRC, ERO1L, PLOD2, and ADM suggesting an expression program triggered by hypoxia. Hypoxia causes stabilization of the HIF-1 transcription factor that mediates the induction of several genes including those promoting anaerobic glycolysis  and the most significant functional group identified in the EASE analysis included glycolytic enzymes and glucose transporters like ENO1, ENO2, PYGL, FUT1, HK2, GLUT1, GYS1, PDK1, CA2, CA12, PGK1 and LDHB, many of which are known markers for hypoxia. The overexpression of hypoxia-induced genes in metastasizing primary tumors provides a basis for further studies of hypoxia in STS to clarify its role in metastasis and to verify potential prognostic and therapeutic utility. In addition, several genes involved in cell proliferation, adhesion and motility e.g. SYMPK, ACTN1, BYSL, VCL, NRCAM, YARS and TLN1 were among the discriminators [see Additional file 22]. 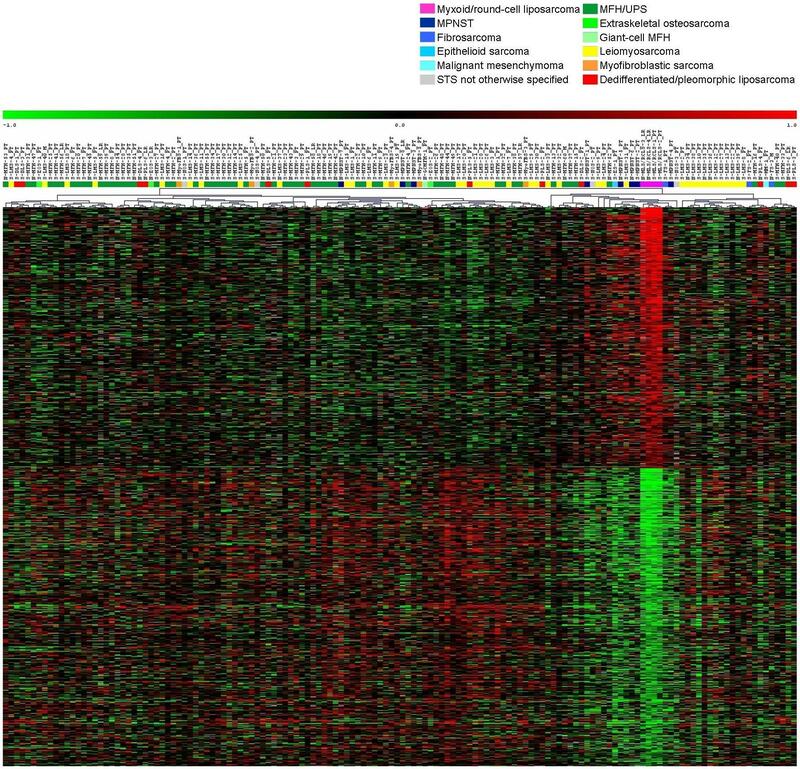 Plot showing FDR within the Golub-score ranked prognostic genes distinguishing the primary tumors that developed metastasis from those that remained metastasis-free. The number of ranked genes is plotted along the x-axis and FDR along the y-axis. Supervised clustering of the 89 primary pleomorphic STS samples based on the 244-gene prognostic signature. Development of metastasis correlated with tumor size (P = 0.006, Mann-Whitney's U and Kruskal-Wallis tests) and necrosis (P = 0.013, Pearson χ2 test), but not with vascular invasion (P = 0.166, Pearson χ2 test). The SVM leave-one-out cross-validation correctly classified 64% of the samples (area under receiver operating characteristic (ROC) curve = 0.64, P = 0.007) into two groups with metastasis developing in 58% (25/43) of the patients in the high-risk group, compared to 30% (14/46) in the low-risk group (P = 0.008, Pearson χ2 test) and significantly predicted metastasis-free survival (P = 0.01, logrank test, Figure 4). The corresponding hazard ratio (HR) from a univariate Cox-regression analysis was 2.4 (P = 0.01) and in a multivariate analysis including the established prognostic factors size, necrosis and vascular invasion, the profile predicted outcome with a HR of 2.2 (P = 0.04) (Table 2). Kaplan-Meier estimates of metastasis-free-survival for patients included in the prognostic subset (5 cases with metastasis at diagnosis were excluded) classified as high-risk or low-risk by the SVM cross-validated classifier. a Proportional hazards assumptions assume constant mortailty ratios and are therefore not met. Thus, the estimated HRs should be interpreted as averages over time. The effects are considerably larger initially and level off with time. From a clinical diagnostic perspective, most STS with specific fusion proteins can be correctly classified based on the combined data from histopathology, immunostainings, and cytogenetic and/or molecular genetic analyses. This stands in contrast to the genetically complex STS subtypes, the diagnosis of which is hampered by suboptimal reproducibility due to extensive histopathological heterogeneity, pleomorphism and lack of type-specific genetic defects. Distinct and homogenous expression profiles have been reported in SS, dermatofibrosarcoma protuberans, clear-cell sarcoma, myxoid/round-cell liposarcoma and GIST [4–13]. Furthermore, the discriminatory profiles that often contain genes located downstream of the type-specific pathogenic gene fusions or mutations have provided novel targets for molecular therapy [15–18]. Gene expression profiles have provided clues to the histogenesis of some STS subtypes, suggested similarities between others and allowed distinction between pathologically inseparable lesions, e.g. neural crest origin of SS, close relation between clear-cell sarcoma and melanoma, and distinct expression profiles for well-differentiated and dedifferentiated liposarcomas [9, 11, 27]. Current data from the more pleomorphic STS, however, indicate that their expression profiles are indeed heterogeneous and in these tumor types the primary goal may rather be to identify novel, yet unidentified subgroups, and to clarify deregulated genes and pathways. Unsupervised cluster analysis of the 177 STS identified two major subclusters; S containing STS with specific fusion genes or mutations, e.g. SS, myxoid/round-cell liposarcoma and GIST, and subcluster C with genetically complex, often pleomorphic STS subtypes, e.g. MFH/UPS, leiomyosarcoma and dedifferentiated/pleomorphic liposarcoma (Figure 1). This is in line with results from previous gene expression and proteomic profiling studies [10, 19, 28]. Discrimination scoring identified genes and pathways differentially regulated in the STS subtypes, with considerable amount of overlap with previously published gene lists despite the differences in tumor material and array platforms [4, 5, 7, 9, 10, 12, 19, 20]. Expression profiles in the distinct subtypes were strong with low FDR whereas the pleomorphic ones had relatively heterogeneous profiles with higher FDR. Identification of diagnostic markers that clearly distinguish different subtypes requires gene lists with very low FDR, but inherent heterogeneity, lack of clear-cut boundaries between subtypes, misdiagnoses and common pathogenic genes and pathways make it rather difficult to generate such strong diagnosis-specific expression profiles in the pleomorphic STS. Some studies chose to exclude samples that did not cluster according to histopathological diagnosis thereby reducing FDR by increasing homogeneity within the subgroups [7, 10]. In the current study, outliers were included but lenient cut-offs were employed allowing some amount of false positives in the gene lists, which were then analyzed using EASE to identify functionally correlated genes. The risk of signifying false positives was reduced by focusing on upregulated pathways and functional groups rather than on individual genes. This approach helped identify biologically relevant genes in dedifferentiated/pleomorphic liposarcoma and fibrosarcoma despite high FDR and upregulation of similar functional groups in SS, GIST, myxoid/round-cell liposarcoma, MPNST and fibrosarcoma. 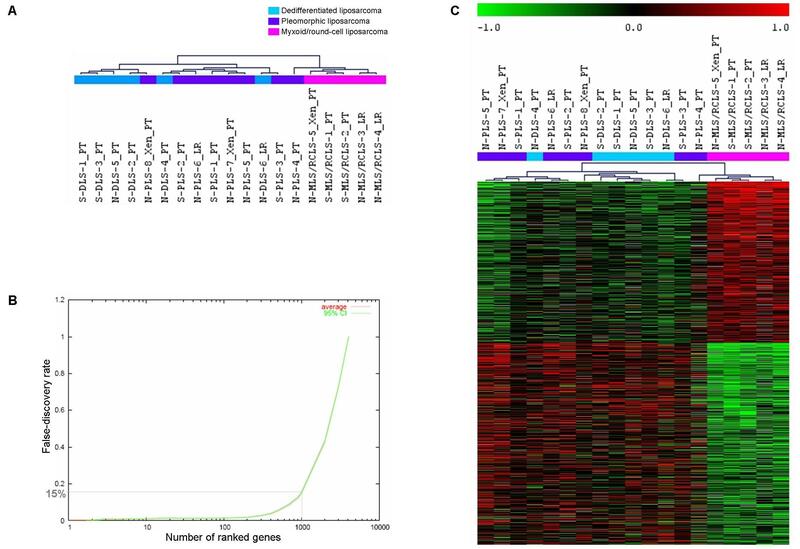 Although alternative SSX fusions and various lines of differentiation can be demonstrated in SS [29, 30], they display homogenous and distinct expression profiles that enable clear distinction from other STS subtypes [4, 9, 10, 12, 19, 20] and our finding of 4000 differentially expressed genes is in line with these results. In the unsupervised clustering, all but one SS were part of subcluster S, within which 5 formed a tight subcluster, together with 3 MPNST samples on a separate branch, away from the main SS subcluster (Figure 1). Supervised clustering based on the 4000 genes also showed close clustering of SS to MPNST [see Additional file 5]. Previous studies have shown that SS and MPNST share similar patterns of gene expression with upregulation of neuroectodermal differentiation genes thereby suggesting a neural crest origin [4, 7, 9] and several neural differentiation genes were also upregulated in the present study. The SS18-SSX fusion product controls gene expression by association with chromatin remodeling complexes through interactions with SWI/SNF complexes and histones [31–33]. Interestingly, chromatin-remodeling genes including several histones and SMARC genes constituted one of the largest functional groups upregulated in the SS. Moreover, the genes identified herein verified the significance of developmental pathways including the FGF, EGF, TGF-β, Wnt, Notch, retinoic acid and Hh receptor signaling pathways, the targeted inhibition of which may provide novel therapeutic options. MPNST may morphologically mimic SS  and in the unsupervised analysis, 5/8 MPNST clustered within subcluster S, and 3 with a subset of SS. Several developmental, neural differentiation and ribosomal protein genes were found to be overexpressed in both MPNST and SS. Fibrosarcomas, like the MPNST, have been shown to cluster with the SS [7, 10]. 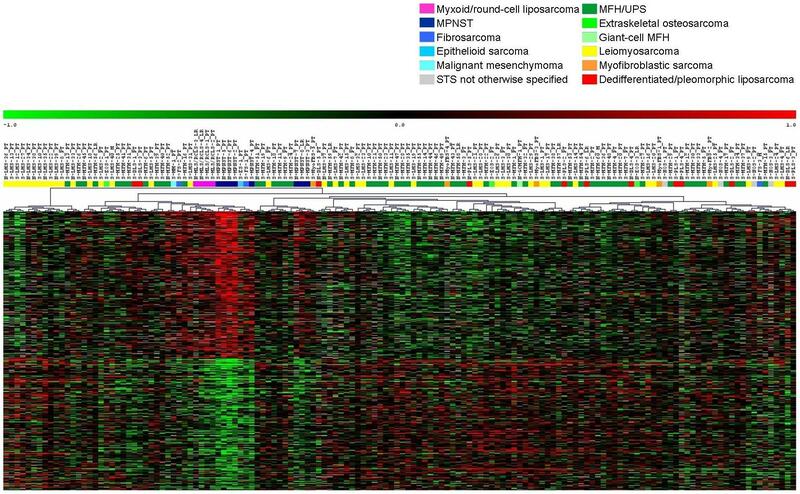 The fibrosarcomas in this study were part of subcluster S and a weak expression signature including many developmental genes distinguished these tumors from the remaining STS. 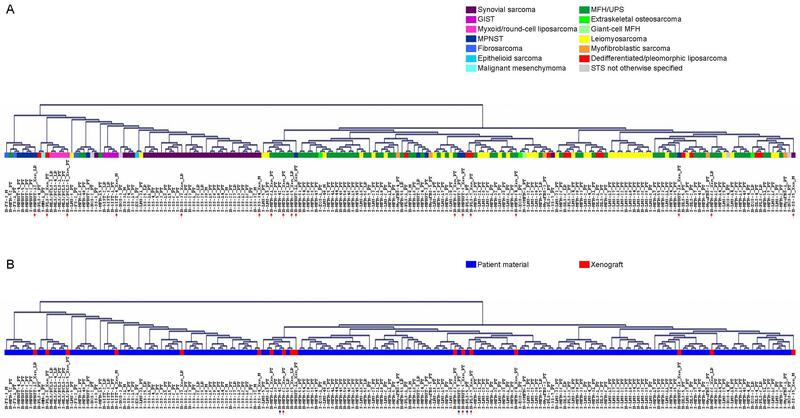 GIST constitute a distinct STS subtype, ~80% of which carry KIT gene activating mutations . These tumors demonstrate distinct expression profiles , with upregulation of genes within the KIT signaling pathway. In addition, several genes involved in neurogenesis and neural differentiation were overexpressed, as were muscle-specific genes like smoothelin and myosin, which may reflect the suggested origin of GIST from the interstitial pacemaker cells of Cajal . Liposarcomas account for about 20% of STS and within this subtype, the myxoid/round-cell liposarcomas characterized by the TLS-CHOP or EWS-CHOP fusions  formed a distinct cluster closely related to a subset of SS and MPNST within subcluster S with upregulation of several developmental and ribosomal protein genes (Figure 1). One of the top most upregulated genes was the lipid metabolism gene PPARG that regulates adipocyte differentiation and constitutes a potential therapeutic target [38, 39]. The dedifferentiated/pleomorphic liposarcomas contain complex genetic alterations and were scattered among the pleomorphic samples in the unsupervised clustering. Most dedifferentiated liposarcomas are characterized by amplifications of MDM2 and CDK4 as part of the 12q amplicons involved in the formation of ring-chromosomes [40, 41]. A relatively weak discriminatory signature mainly characterized by overexpression of the 12q amplicon genes distinguished a small subset of the dedifferentiated/pleomorphic liposarcomas [see Additional file 17]. PPARA and other lipid metabolism genes were also overexpressed. Comparison between myxoid/round-cell and pleomorphic/dedifferentiated liposarcomas revealed overexpression of ribosomal proteins and developmental genes related to Wnt signaling and neurogenesis in the former group, whereas genes related to cell-cycle, homeostasis, and a greater number of lipid metabolism genes were upregulated in the latter. Skubitz et al. demonstrated separation of myxoid liposarcoma from non-myxoid liposarcoma using a set of ribosomal genes . 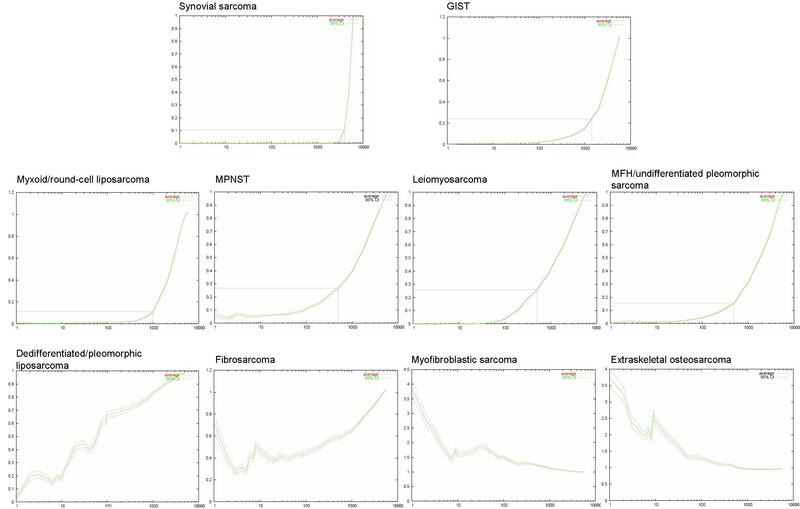 Our series included a large proportion of pleomorphic, undifferentiated STS with the hope of gaining novel insights into the origin of these genetically complex tumors and establishing a more refined classification. 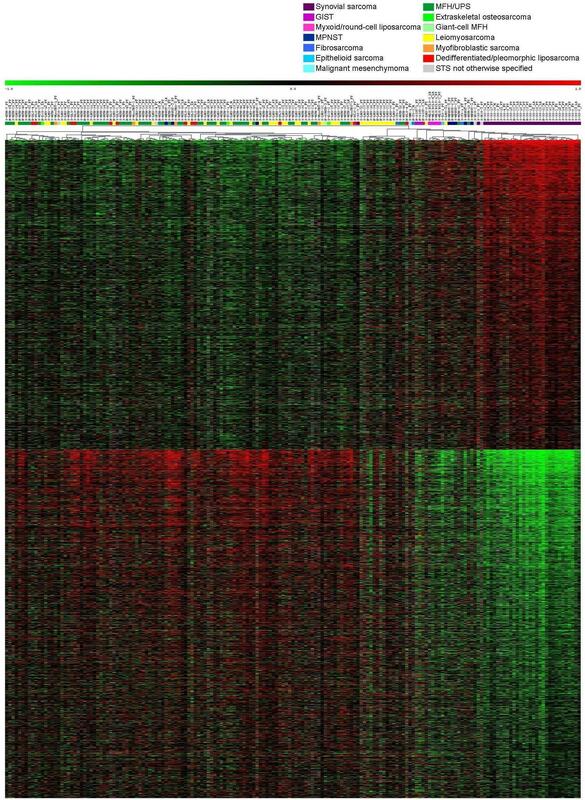 About one-third of the leiomyosarcomas clustered tightly within subcluster C and a 200-gene signature with overexpression of genes related to muscle structure and function was identified in these tumors (Figure 1). 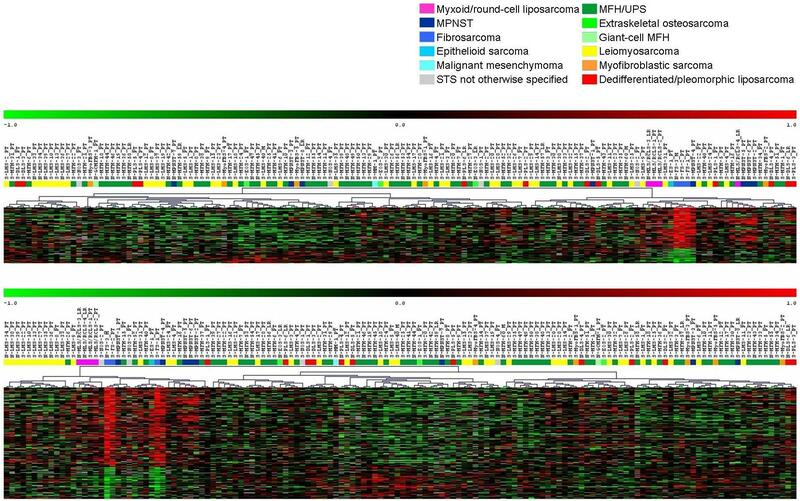 This is in line with previous results from gene expression and proteomic profiling demonstrating that while the more pleomorphic leiomyosarcomas cluster with the MFH, another more distinct subset cluster separately [19, 28]. MFH was introduced as a separate diagnostic entity in the 1960s, but constitutes a heterogeneous group of poorly differentiated tumors with poor diagnostic reproducibility . In our series, one-third of the tumors represented MFH/UPS, all but 5 of which fell within subcluster C (Figure 1). A 500-gene signature grouped together about half of the MFH/UPS [see Additional file 15] including several genes from the extracellular matrix and inflammatory response, reflecting the fibrous and histiocytic features of these tumors, as well as others involved in the regulation of cell-cycle, proliferation, adhesion, motility and protein degradation. Novel prognostic and therapeutic markers would be of great clinical value in STS since risk stratification is currently difficult and adjuvant treatments are toxic and hampered by low efficacy. 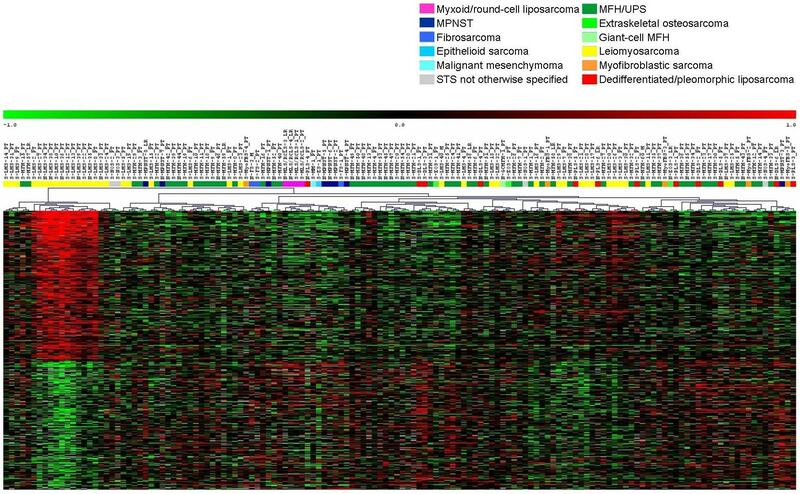 We identified a 244-gene prognostic signature in 89 primary, high-grade STS mainly representing MFH/UPS and leiomyosarcoma. This signature was characterized by upregulation of several hypoxia-related genes (e.g. HIF1A and its targets) and genes involved in cell proliferation, adhesion and motility in metastasizing STS. Our data are the first to suggest a prognostic profile modulated at least in part by hypoxia in a large series of highly malignant STS of mixed types. The cross-validated classifier predicted metastasis with an accuracy of 64% and provided prognostic information independent of currently used prognostic factors from the SIN-system, namely tumor size, vascular invasion, and necrosis . Gene expression profiles that correlate with poor outcome have previously been recognized in Ewing sarcoma and leiomyosarcoma [21, 22, 44], Ren et al. identified a 92-gene signature in 11 leiomyosarcomas that separated high-grade metastatic tumors from low-grade well-differentiated ones, whereas Lee et al. took a different approach and predicted metastasis in a set of 30 primary leiomyosarcomas and local recurrences using the expression profile of 335 genes that initially distinguished primary leiomyosarcomas from metastases [21, 22]. However, none of the reported genes were among our 244 discriminators, which may not only be because they were established in a set of leiomyosarcomas using different approaches whereas our signature was established in a larger mixed series of pleomorphic primary STS, but also due to the difficulties in identifying prognostic signals which are considerably weaker than the diagnostic ones. An adverse prognostic impact of hypoxia has been demonstrated in several malignancies and tumor oxygenation studies in STS have suggested an association of hypoxia with tumor grade, presence of mitoses and metastatic development [45–48]. A recent study demonstrated that HIF1A expression was an independent prognostic factor in STS . Hypoxic tumors display high rates of glucose uptake and glycolysis regulated by HIF1 that induces expression of glucose transporters like GLUT1 and glycolytic enzymes like ENO1, HK2, LDHB and PGK1, which were overexpressed in the metastasizing tumors. CA9 expression, an intrinsic cellular marker for hypoxia, has been suggested to correlate with poor survival in high-grade STS , and GLUT1 expression and enhanced glucose metabolism in STS have been linked to proliferative activity and tumor grade [52–55]. Detwiller et al. demonstrated that the expression pattern of a selection of 107 hypoxia-related genes allowed distinction of mixed STS samples from normal tissue, and several of the overexpressed genes therein were among our discriminators . In summary, diagnostic gene expression profiles were identified for different subtypes with distinct profiles in STS with specific fusion genes or mutations, whereas the diagnostically difficult pleomorphic STS were challenging also with regards to expression profiling. The SS, GIST, myxoid/round-cell liposarcomas, MPNST and fibrosarcomas shared similarities in expression profiles with overrepresentation of developmental genes involved in differentiation and morphogenesis. On the other hand, genes involved in cell-cycle, proliferation, adhesion, motility, protein degradation, homeostasis and immune-response seemed to play an important role in the pleomorphic subtypes. The novel genes and pathways identified provide important information about tumor origin and constitute potential therapeutic targets. Our identification of a prognostic profile in the latter group is highly promising, and provides information independent of the currently used prognosticators. Moreover, it is intriguing that upregulation of hypoxia-related genes predicts metastatic potential in high-grade, pleomorphic and genetically complex STS and calls for further evaluation of HIF1A and its target genes in STS. Tumor samples were obtained from 177 patients operated between 1972 and 2003 at the Lund University Hospital, Lund (n = 122), the Norwegian Radium Hospital, Oslo (n = 47) and the Karolinska Hospital, Stockholm (n = 8). Ethical permission for the study was obtained from the Lund University research ethics committee and the Regional Ethics Committee of Southern Norway. The tumor samples consisted of 154 primary tumors, 16 local recurrences and 7 metastases, and the latter samples were included after assuring that neither local recurrences nor metastases formed separate clusters (data not shown). The 177 samples represented 13 subtypes, among which MFH/UPS, leiomyosarcoma and SS together constituted 75% (Table 1). All tumors were reviewed by the Scandinavian Sarcoma Group (SSG) review board of pathologists and many tumors had in addition been reviewed by one of two reference pathologists (BB & MÅ), who also belonged to the SSG board of pathologists. The diagnoses were based on the combined information from histopathology, immunohistochemical staining, and cytogenetic and/or molecular genetic analyses. The SS18-SSX gene fusion was confirmed in 24/32 synovial sarcomas (13 with SS18-SSX1, 10 with SS18-SSX2 and 1 with SS18-SSX4), and the TLS-CHOP fusion in 2/4 myxoid/round-cell liposarcomas. The 8 MPNST were all derived from patients free of neurofibromatosis. Malignancy grading was based on a IV-tiered scale, and in line with our aim to improve diagnosis of high-grade tumors, 97% of the tumors were classified as high-grade (grades III and IV). Only a small minority of the patients received preoperative treatment with radiotherapy (n = 1) or chemotherapy (n = 5). The study is aimed at tumors located in the extremities and the trunk wall, but 14/177 (8%) abdominal/retroperitoneal tumors were included since they contributed with data on rare tumor types and did not cluster separately (data not shown). Besides the 177 patient samples, 17 xenografts (including 6 MFH/UPS, 4 MPNST, 3 SS, 2 pleomorphic liposarcomas, 1 myxoid/round-cell liposarcoma and 1 GIST) were included, but were not used for the generation of discriminatory gene lists. Analysis of a prognostic expression profile was performed in 89 primary pleomorphic tumors, mostly including MFH/UPS and leiomyosarcomas. The prognostic system used for clinical decisions included evaluation of necrosis and vascular invasion. Necrosis was classified at histopathological examination either if identified macroscopically or when identified microscopically at careful examination. Necrosis was identified in 66/89 (74%) tumors in the prognostic subset, thus at a high rate. Vascular invasion also carefully examined for prognostic purposes was identified in 17/89 (19%) of the tumors (Table 1). All 89 patients had undergone primary surgery without preoperative radio- or chemotherapy and only 9 patients were treated with postoperative chemotherapy. Metastasis developed in 39 (44%) patients after median 9 (range 0–65) months and the mean follow-up for the survivors was 7 (range 1–16) years. RNA extractions from 47 tumors and the 17 xenografts were carried out at the Norwegian Radium Hospital, whereas the remaining 130 samples were extracted at the Lund University Hospital, and all 194 samples were labeled and hybridized in Lund. The cDNA microarray slides used were produced at the Swegene DNA Microarray Resource Center, Department of Oncology, Lund University and contained 27649 spots with sequence-verified IMAGE clones from the Research Genetics IMAGE clone library. The clone information was linked to gene names using build 180 of the Unigene database  and ~16000 unique Unigene clusters were represented on the array. The RNA extraction, cDNA synthesis, labeling, hybridization and subsequent image and data processing were carried out as previously described . Background correction, filtering, transformations and analyses were performed using a local installation of the web-based BioArray Software Environment (BASE) [59, 60]. A preliminary filtering step eliminated all spots of poor quality like those flagged 'not found' or 'bad' in GenePix™ Pro 4.1.1.4 version (Axon instruments Inc., Foster City, CA), spots with diameter lesser than or equal to 60 μm, spots with more than 10% pixel saturation and signal-to-noise ratio less than 1.5 in either channel. The background corrected intensity values were then normalized using the pin-based LOWESS method to compensate for dye bias and local background effects . Here, intensity dependent adjustments (LOWESS fits) were performed within groups of 16 blocks to correct for spatial bias. Multiple print batches of slides were used, with 41 samples hybridized in replicates on different batches. All repeats clustered next to the first sample run irrespective of the differences in print batch (data not shown), hence replicate assays were merged in a weighted fashion, as previously described . Within each slide, expression values for spots associated to the same gene symbol were merged in a similar weighted fashion. A student's t-test identified ~2500 genes (P = 0.05) that differed in expression between samples extracted in Norway and Sweden and ~1800 genes (P = 0.05) that differed between tumors and xenografts suggesting the presence of technical and biological bias within the data set. In order to eliminate the technical bias introduced by the RNA extractions carried out at different laboratories, centering was applied independently to the 64 (tumors and xenografts) Norwegian and 130 Swedish samples. The xenograft samples, wherever used in the analysis, were centered separately a second time to compensate for the inherent biological differences that exist between tumors and xenografts. Following independent centering of the mentioned sample groups, the student's t-test failed to identify significant genes that distinguished the groups confirming that very little, if any, of the bias remained. Moreover, in later steps no apparent clustering was observed based on RNA extraction or depending on whether the sample was from a tumor or xenograft. The data were then transformed using an error model, as previously described, to reduce the importance of poor-quality spots in later analysis steps . Filters for variation and presence of expression across hybridizations were set to reject all spots with a standard deviation of modified expression value smaller than 0.2 and a presence in less than 70% of the samples. Unsupervised agglomerative hierarchical clustering was performed with the help of the TMeV application from the TM4 microarray software suite , using the average-linkage method and the Pearson correlation distance metric . Golub-score analyses, named after the widely referenced paper by Golub et al. , and random permutations were performed as previously described  on 177 and 142 (excluding SS and GIST) tumor samples in order to generate discriminatory gene lists for the different subtypes. The SS and GIST, which revealed distinct expression patterns, were excluded in order to identify the more subtle differences in genetic profiles of the remaining STS subtypes. Approximately 6000 genes were ranked on their Golub-scores – a high score for a gene implicating minor variation in expression within the subtype but large variation between the subtypes, in turn implicating high discriminating power. 1000 random permutations were performed to assess the discriminating power of the scores and to establish FDR. Furthermore, the 19 liposarcoma samples (16 tumors and 3 xenografts) were analyzed independently to identify a genetic signature distinguishing the myxoid/round-cell liposarcomas from the dedifferentiated/pleomorphic liposarcomas. Golub-score analysis was also used to identify a metastatic signature within a subset of 89 primary, mainly high-grade, pleomorphic tumors. To obtain a more robust list of prognostic discriminators, a consensus gene list was created. The 89 samples, 39 of which metastasized, were randomly split into two halves preserving the ratio of metastasizing samples and each half was used to create two Golub-score ranked gene lists. 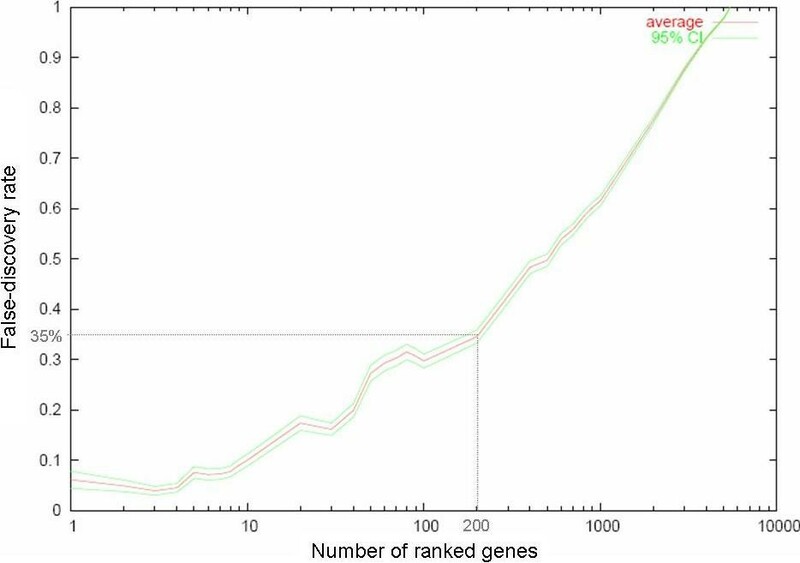 The above step was iterated 100 times to obtain 200 gene lists in total, from which a consensus gene list was established by ordering genes according to median rank. The top 244 genes (median rank < 700) were used to cluster the samples in TMeV. Thereafter, leave-one-out cross-validation using the SVM option in TMeV was performed on the 89 samples based on all ~5500 genes that passed the above-mentioned filter criteria in order to obtain an unbiased classification that was later used in the univariate and multivariate analyses. The discriminatory gene lists were further analyzed using the EASE software  to functionally classify the genes and facilitate biological interpretations . The top ranked genes were classified into groups within the categorical systems of the Gene Ontology (GO) Consortium (GO Biological Process and GO Molecular Function), the KEGG pathway, biochemical process, cellular role and chromosomal regions. The EASE analyses in SS and myxoid/round-cell liposarcomas employed the top 4000 and 1000 genes (with 11% FDR) respectively. Gene lists with less stringent cut-offs were used for the GIST (top 1500 with 25% FDR), MFH/UPS (top 500 with 16% FDR), leiomyosarcomas (top 500 with 26% FDR) and MPNST (top 500 with 27% FDR), which allowed more genes into the gene lists making it possible to identify functional correlations between the discriminatory genes and similarities in expression profiles between the different subtypes. Focusing on upregulated pathways and functional groups rather than on individual genes reduces the risk of signifying biologically irrelevant genes, especially in gene lists with high FDR. All functional groups mentioned had an EASE score < 0.05. The χ2 test for association, the Mann-Whitney's U test, and the Kruskal-Wallis test were used to assess associations of tumor size (as a continuous variable), necrosis (present vs. absent), vascular invasion (present vs. absent), and the SVM cross-validated classification with the development of metastasis. Metastasis-free survival curves were constructed by the Kaplan-Meier method and compared by the log-rank test. Univariate and multivariate Cox-regression analyses were performed to estimate HRs and to assess the independence of the cross-validated classification from the above-mentioned prognostic factors. Proportional hazards assumptions were checked using Schoenfeld's test . Areas under ROC curves were compared using an algorithm suggested by DeLong et al. . A two-tailed P-value of less than 0.05 was considered significant for all tests. Stata 9.2 was used for the statistical analyses (Stata Corporation, 2003, College Station, TX). We would like to thank the orthopedic surgeons at the University Hospitals in Oslo, Stockholm, and Lund for preserving tumor tissue and the pathologists within the Scandinavian Sarcoma Group for histopathological review. This study was supported by grants from the Swedish Cancer Society, the Swedish Research Council, the Nilsson Cancer Fund, the Kamprad Research Fund, the K. and A. Wallenberg Foundation via the SWEGENE program, the Swedish Foundation for Strategic Research through the Lund Center for Stem Cell Biology and Cell Therapy, the Swedish Children's Cancer Fund, the Research Funds at Lund University Hospital, the Norwegian Cancer Society, and the Norwegian Health and Rehabilitation Fund. PF drafted the manuscript and carried out RNA extractions, hybridizations and data analyses. HMN performed extractions and hybridizations of the Norwegian samples and participated in the data analyses. CM assisted with clinical annotations of the Norwegian samples. PE designed the BASE plug-ins and assisted with the computational analyses. JF, JMB and AI performed RNA extractions and hybridizations. BB and MÅ were the pathologists who reviewed the tumor samples. POB performed the statistical analyses. AR participated in the design of the study and clinically annotated the Swedish samples. OM and MN conceived of the study, and participated in its design and coordination. All authors read and approved the final manuscript.